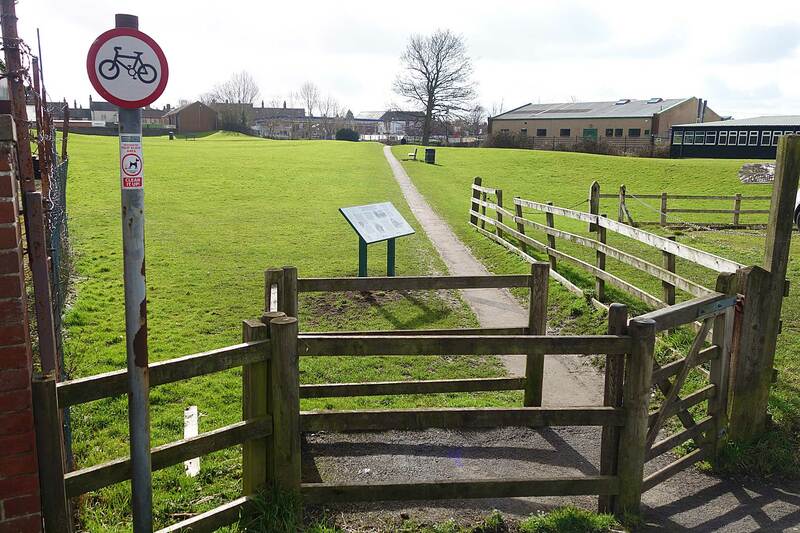 Turn right, taking the footpath that leads across the grassy area northwards to the next board. Unfortunately this is mistakenly labelled board 1! After William’s conquest of England following the invasion of 1066 the Norman barons were rewarded with vast tracts of land. Thirsk and its surrounding region formed part of the estates of the powerful Mowbray family and the building of a castle on this site was probably carried out around 1092 by Robert de Mowbray who was then Governor of Northern England. It was from Thirsk that Robert de Mowbray marched north to defeat an army of invading Scots led by their King Malcolm who was cornered and slain at Alnwick. By the time of King Stephen (1135-1153) Thirsk Castle was the home of the young Roger de Mowbray and his widowed mother lady Gundrea de Albini. In 1138 a group of twelve monks led by Abbot Gerold arrived in Thirsk. Four years earlier they had been sent from their Savigniac monastery at Furness to found a new abbey at Calder in Cumberland, but fleeing from marauding Scots, they had come to Yorkshire to find a place to establish themselves. Gundrea sheltered them here in Thirsk before sending them on to settle at Hood on the edge of the Hambleton Hills where her uncle lived the solitary life of a hermit. It was these monks who, after several abortive attempts at establishing a permanent monastery, exchanged their Savigniac rule for the Cistercian mode and, with substantial grants of land, founded Byland Abbey in 1177. In 1138, the year the monks came to Thirsk, there was renewed fighting with the Scots who had swept through Northumberland and Durham and across the Tees. They were opposed by the Yorkshire barons led by Thurstan, Archbishop of York. To encourage the English army, the Archbishop contrived a great mast mounted on wheels, topped by a casket holding a consecrated wafer and flying the banners of the four patron saints of the North; it was to be the rallying standard in the fight that was to follow. 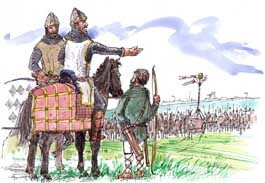 Mustering at Thirsk, the barons marched to meet the Scots just beyond Northallerton, where the English army routed the Scots in the Battle of the Standard and drove them back beyond the Tees. In the years that followed, Roger de Mowbray joined the party of Prince Henry in rebellion against Henry II. Roger had backed the losing side, however, and though pardoned by the King, his castles were declared forfeit and destroyed in 1176.